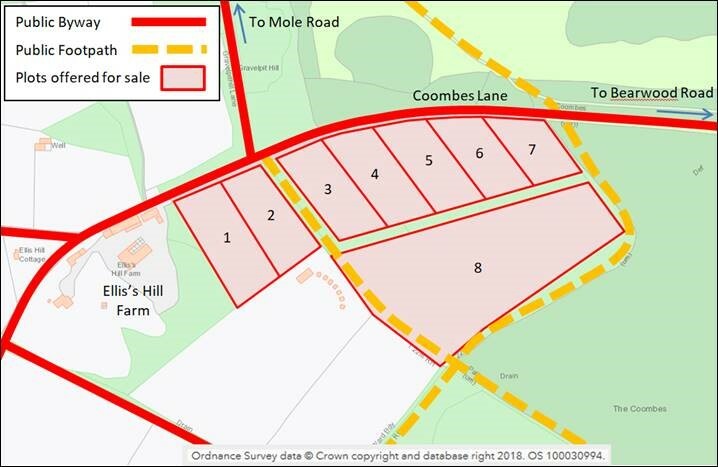 This is an update on our recent Development Watch alert (18 July) on the potential threat to the Coombes. A more detailed update will be in the autumn edition of the Barkham Newsletter. Recently, a number of parcels of land to the east of Ellis’s Hill Farm were offered for sale, with two of them being sold at auction at the end of July. These were parcels 2 and 3 on the map, and it is likely that there will be further attempts to sell the other six parcels. The Coombes is protected by a Tree Preservation Order and is designated as a Local Wildlife Site. This means that no trees should be interfered with, or structures such as fences added, without planning permission. It is believed that Wokingham Borough Council would not grant such permission. However, the new owners and other prospective buyers may not be sufficiently aware of these restrictions, or indeed respect them. by email to Development.control@wokingham.gov.uk or phone 0118 974 6000 and ask for Planning Control. Please also copy development@barkham.org.uk so that the BVRA is made aware of the activity.